1. What will you do to prepare my apartment before I move in? Shampoo carpets, clean, and paint as needed. 2. Do I have to be present for a service technician to perform work? No, you do not have to be present for work to be completed. 3. Do you have on-site maintenance? 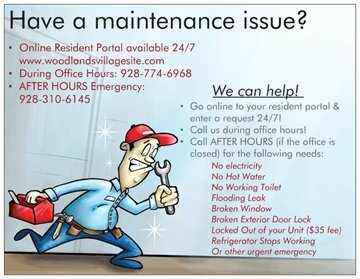 Yes, we have on-site maintenance and after-hours emergency On-Call Maintenance. 4. An item in my unit needs repair. How do I get help? Call, stop by the office, email, or put in a service request through the online Resident Portal. 5. What happens if I am locked out? During business hours come to the Leasing Office and present your ID to borrow a key. After hours call the emergency On-Call Maintenance. A $35.00 lock-out fee will be charged for after-hours lock-out response. Yes. Parking is unassigned, and you are allowed one passenger vehicle per lease signer. 2. What amenities does the property offer? Seasonal Pool, Indoor Spa, 24-Hour Fitness Center, Fire Pit, Clubhouse with Pool Table, Gaming System, and Computers. 3. During which time periods are the pools and decks available for use? Pool is generally open Memorial Day through Labor Day, 8:00am to 10:00pm, 7 days a week. 4. Is your community pet friendly? Yes! Exotic animals are prohibited; contact the Leasing Office for further details. 5. What appliances are standard? 6. Do you offer furnished apartments? Yes, with a minimum 3 month lease term when available. 1. How long does it take for an application to be approved? Once all information needed to process the application has been received, final processing generally takes about 48 hours. 2. What are my options for paying my rent? One personal check for full amount of rent, money orders, or Cashier's Check. 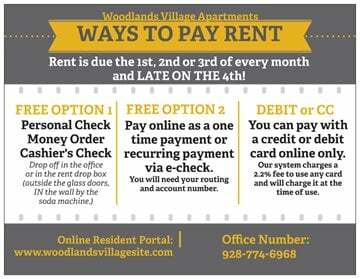 You can also pay online through the Resident Portal with a checking or savings account at no additional charge. A Visa, MasterCard, or Discover Card may be used online only with a convenience fee charge. 3. Am I required to purchase renter's insurance? Yes, Renter's Insurance is required at move-in and must be in force throughout the term of your residency. Minimum $100,000.00 liability, you choose your amount for personal property coverage, and Community is named as an Interested Party or Certificate Holder. 4. Which provider can I use for Internet and cable? Suddenlink for cable and internet or Century Link for Direct TV and internet. 5. If my situation changes can I get out of my lease? Although you are ultimately responsible for the obligations in your specific lease, there may be a few options where we can help you. Please consult the leasing consultant or property supervisor to go over your options. 6. How do I set up my utilities? Call each utility company directly to set up your accounts (APS for electric service). 7. Which utilities are included in my rent? Residents are responsible for all utilities. Water/sewer/rubbish charges will be billed monthly by the community in addition to the monthly rent. 1. Is there public transportation within close proximity of the buildings? Yes, the city bus line has a stop within a block of the community.Mountain Line: NAU students ride Mountain Link/Route 10 FREE with their JacksCard ID. 2. How do I get to your community? From Milton Road heading north, turn left onto University Avenue. Go straight through the stop sign, and we are on the left. 1. How can I apply for an apartment? Applications are completed online through our community website. Application, payment of a $300.00 holding deposit, all non-refundable application fees, and a signed and dated Reservation Form are needed in order to reserve your apartment. 2. What if I’m not ready to apply? What other options are there? Contact the Leasing Office at (928) 774-6968 for more information. 3. What do you look for in the application? Employment, Income, Rental History, Credit, and Criminal background information are a part of our screening process. 4. How can I check availability for furnished apartments? Contact the Leasing Office directly at (928) 774-6968. 5. Do I have to make an appointment or do you accept walk-ins? Appointments are preferred, and we are happy to accept walk-ins. 6. Does this community offer a bonus if I was referred by one of my friends? We do offer a Resident Referral program. Consult the Leasing Office for further details. 7. How accessible is the management at the local office? On-site management is available Monday through Saturday. 8. Where specifically in the apartment community is the apartment located? The Community Leasing Office will provide you with a map indicating the exact location of the available apartments. 9. What’s the noise level like? Quiet hours are from 10:00pm to 7:00am. 10. Where are the washer and dryer/hookups? There is a laundry facility on-site. 11. Where do residents shop? Safeway and Target are both within easy walking distance from the community. 12. Are there fees for using communal spaces? Fees may apply for Clubhouse usage. Contact the Leasing Office for additional information. 13. What happens when there’s a maintenance problem in the apartment? Contact the Leasing Office or put in a service request through the online Resident Portal. If it is an after-hours emergency, call the On-Call Maintenance. 14. How much will I pay in up-front costs when I sign the lease? When you reserve your apartment you will be provided with a Reservation Form that breaks down the overall cost for move-in including all required deposits and fees.